Heysen painted a number of portraits of strong women, and selected Miles because she was a "young, forward lass". 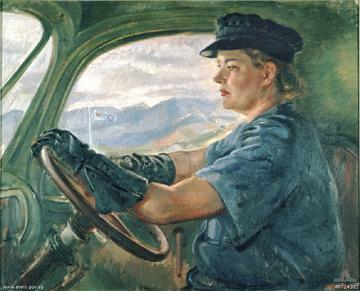 In 1942, aged 21, Miles enlisted in the Women's Auxiliary Australian Air Force, the first and largest of the three women's services formed during the war. As she held a driver's licence, she was assigned to drive a bus. This is a compelling portrait of a confident young woman who, despite the masculine uniform and large leather gloves, retains her femininity.